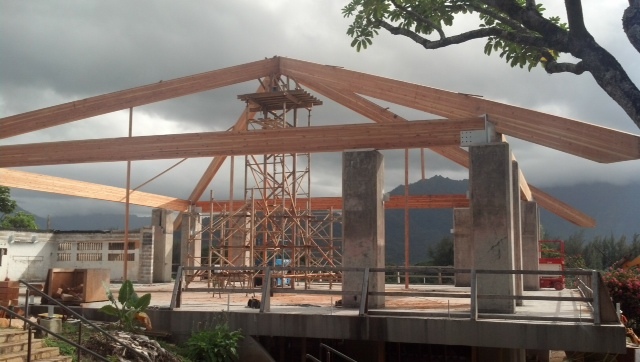 Construction is Underway at Hanalei Bay Resort's Restaurant and Bar! After many months of waiting for funding, planning, approvals, and permits; reconstruction is finally underway on the building that was once home to the Bali Hai Restaurant at Hanalei Bay Resort. The photo below shows the beams shortly after being lifted into place for the roof structure. The popular Bali Hai Restaurant, the Fitness Center and the Sundry Shop at the resort have been closed since a fire destroyed the building in July of 2011. Although the fire did not damage the Happy Talk Lounge, it destroyed the kitchen for both restaurants making it impossible for them to open. Although we are very happy to see construction begin, we do not yet know when the Happy Talk Lounge and Bali Hai Restaurant will reopen for business. We will post more information when it is available. 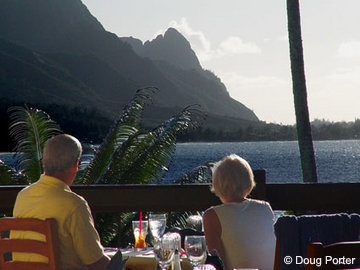 Bali Hai Restaurant at Hanalei Bay Resort is a wonderful place to watch the sunset and enjoy Pacific Rim cuisine. This place is about as romantic as it gets with open air seating in a lush tropical setting, with stunning views across Hanalei Bay of the mountains and sunset over Bali Hai that you won't soon forget. The Bali Hai Restaurant and Happy Talk Lounge are located at Hanalei Bay Resort. Most of the herbs, lettuce, and vegetables used in this menu are organically grown in our garden. 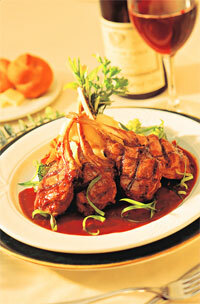 We use only the freshest Kauai products available from local vendors. Broiled Black Angus Tenderloin on a bed of Caramelized Maui Onions and Sautéed Mushrooms with Madeira, Port Wine, Balsamic Reduction Sauce. Served with Wasabi Garlic Mashed Potatoes. A Combination of Pacific Tiger Shrimp and Sea Scallops with Pineapple-Papaya Beurre Blanc & Cilantro Infused Oil. Served with Wasabi Garlic Mashed Potatoes. 10 oz. Striploin Crusted with Five Color Peppercorns and Grilled to Perfection and topped with a Sake, Soy Garlic sauce. Served with Okinawan Sweet Potatoes. Fresh Catch of the "Hukilau"
Topped with Portobello Mushrooms, Encrusted with Blue Crab and Boursin Cheese. Served with Wasabi Garlic Mashed Potatoes. Blackened and Glazed with a Peppered Pineapple-Mango Chutney, Served with Steamed White Rice. Broiled and Topped with Green Coconut Milk, Sweet Chili and Peanut Sate Sauce and Wasabi Garlic Mashed Potatoes.